A year ago I had the wonderful opportunity to participate in a workshop with Art Wolfe in the Acadia National Park in Maine. Now, newly inspired from a recent one-day seminar with Art, I headed back to Acadia for a weekend trip of hiking and photography with my mother, who was visiting from Germany. We arrived in the afternoon in a mix of rain and fog. I headed straight for the coastline, hoping to get a nice shot of the rocky shoreline in this weather. I was hoping for a long exposure of the waves coming in over the rocks. Below you can see the result of a 30 second exposure of the shore. By the way – should an Art Wolfe seminar be in a city near you, I highly recommend to attend. Get ready to be inspired! 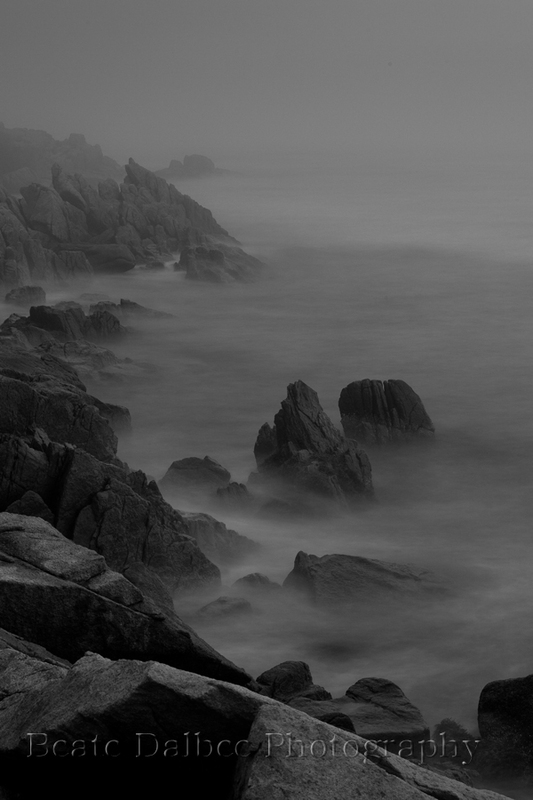 Love this Beate…such visual tension between the rocks and the water and fog. I need to take a seminar with Art as he is almost in my backyard.